In “Suddenly Single Sylvia: Plus Boomer Dating Guide” by Angela Page, poor Sylvia discovers that her husband has left her for a 35 year old woman. The mistress actually might be fibbing about her age a bit, but still she plays a role in the break-up of Sylvia’s marriage. At fifty-five years old, this leaves Sylvia in a bit of a financial predicament. Her ex is so caught up in his new relationship that he is lax on sending her alimony. After getting revenge by dumping all of his expensive, imported alcohol into the bath tub, Sylvia realizes that she has to get it together to come up with a plan to bring in income. She does not want to lose her house. She creates a dating service for the baby boomer generation. She also takes on a roommate who is supposed to trade housekeeping for rent. This goes south quickly after Sylvia discovers that the roommate and a girlfriend are making meth in the basement. Sylvia gets rid of her and brings in a young Asian transgender woman named Kiki or Kevin, and a Hispanic psychic chiropractor that goes by the name, Dr. Honey. The three of them are off on a great adventure as Sylvia works on building her business. She also finds time to date, but doesn’t quite follow her own rules. Her Xanax breadcrumbs help carry her through! 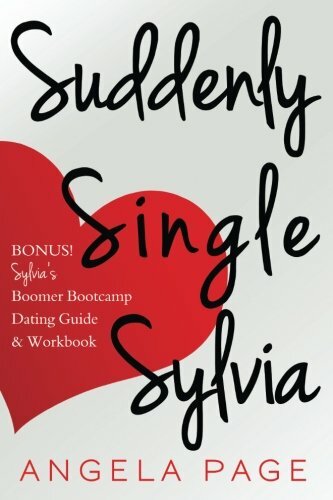 In spite of this not being a large book, “Suddenly Single Sylvia: Plus Boomer Dating Guide” is full of lots of laugh out loud adventures and some great advice about dating. Even though I was born three years too late to be a baby boomer, I still found the advice to be helpful. After Sylvia’s story is told, the author includes Silvia’s Boomer Boot Camp Dating Guide and Workbook in the second half of the book. There is a lot of great information in there! While I either found myself cringing or laughing through the pages, I also saw a lot of valuable insight for newly single people in the over 50 crowd. After I went through my divorce, I discovered the value of “Xanax breadcrumbs,” however, my friends referred to them as my “blue crumbs.” It is good to know that I wasn’t alone! I highly recommend “Suddenly Single Sylvia: Plus Boomer Dating Guide” by Angela Page to readers over 50 years old who are going through divorce. It will help them find some humor in their situation and also gain great advice for when they are ready to get out there again. I think this book would be a great gift for someone in this situation.